Download "Configuring and Deploying a Private Cloud. Day(s): 5. 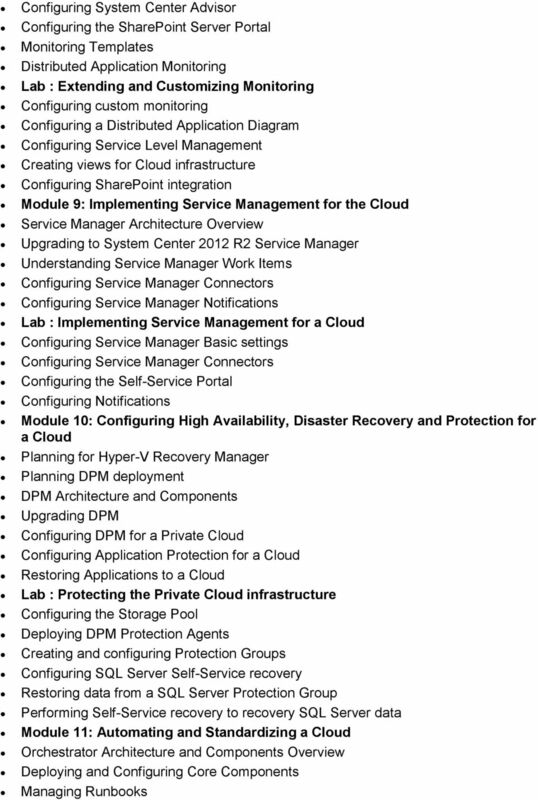 Overview"
1 Configuring and Deploying a Private Cloud Day(s): 5 Course Code: M20247 Overview This course equips students with the skills they require to configure and deploy a cloud using Microsoft System Center 2012 R2. Using hands-on labs, students learn the following: - Produce a high-level design that accounts for requirements for cloud environments. - Configure and deploy the cloud fabric. - Configure a PXE server, an update server, and a software update baseline. - Configure Microsoft Server Application Virtualization (App-V) so that it can be used to sequence and deploy an application virtually. - Build the core components necessary for delivering services on the fabric. - Allocate resources to a cloud and grant access to a cloud - Understand how to monitor clouds using Operations Manager. - Understand the tools necessary to extend and customize Operations Manager for cloud environments. - Set up, configure, and integrate the core components of Service Manager into a cloud fabric. - Configure a service catalog, and then publish it to the Self-Service Portal. - Gain the knowledge necessary to deploy and configure Data Protection Manager in a cloud. - Deploy and configure Orchestrator in a cloud, and then integrate it with other System Center components. 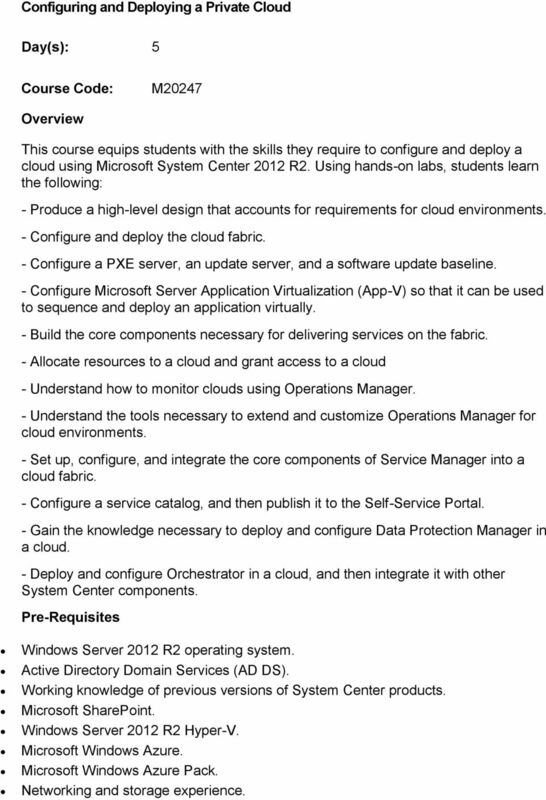 Pre-Requisites Windows Server 2012 R2 operating system. Active Directory Domain Services (AD DS). Working knowledge of previous versions of System Center products. Microsoft SharePoint. 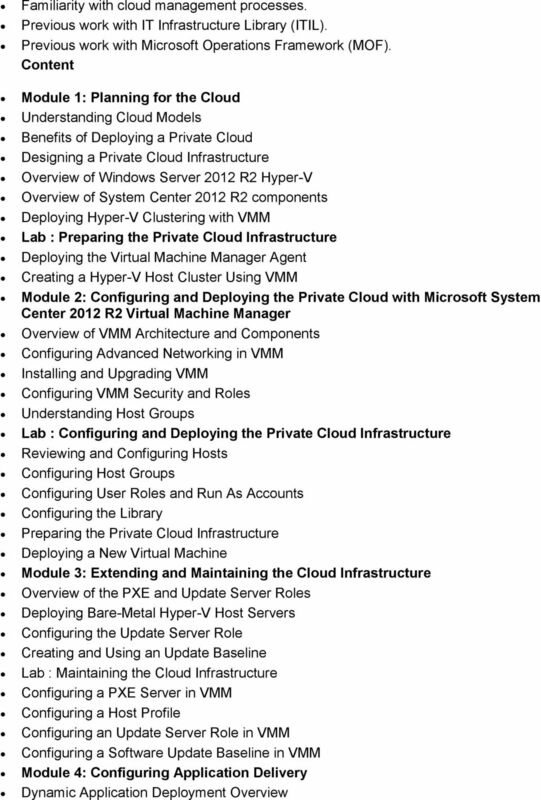 Windows Server 2012 R2 Hyper-V. Microsoft Windows Azure. Microsoft Windows Azure Pack. Networking and storage experience. 5 Configuring Integration Packs Lab : Automating the a Private Cloud Deploying a Runbook Server and configuring Integration Packs Configuring a template to deploy agents to a new Virtual Machine Creating a Runbook to protect all resources on a Virtual Machine Module 12: Configuring a Self-Service and Multi-tenant Private Cloud Implementing the Cloud Services Process Pack Configuring the Windows Azure Pack Lab : Configuring the Cloud Services Process Pack Installing the Cloud Services Process Pack Configuring User Roles and settings Configuring Service Offerings Creating an Incident Request Objectives Plan for a hybrid cloud. 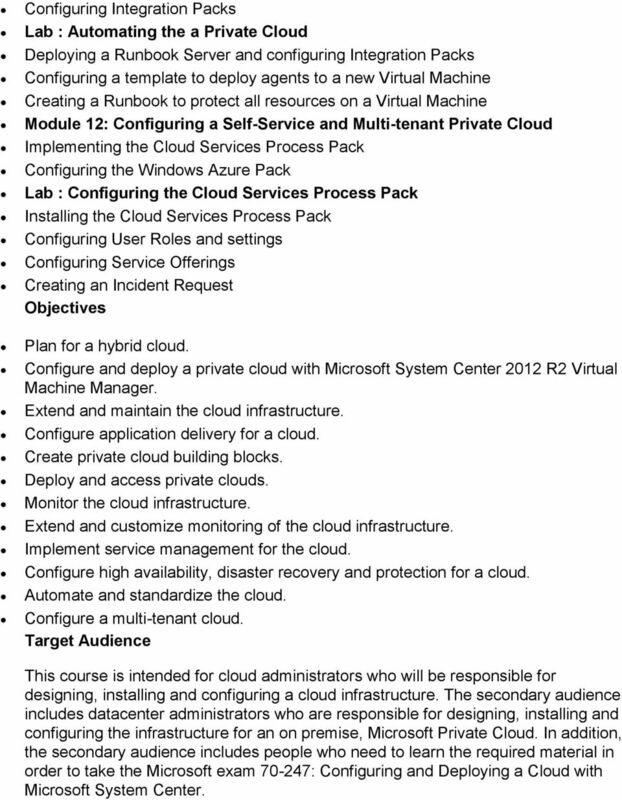 Configure and deploy a private cloud with Microsoft System Center 2012 R2 Virtual Machine Manager. Extend and maintain the cloud infrastructure. Configure application delivery for a cloud. 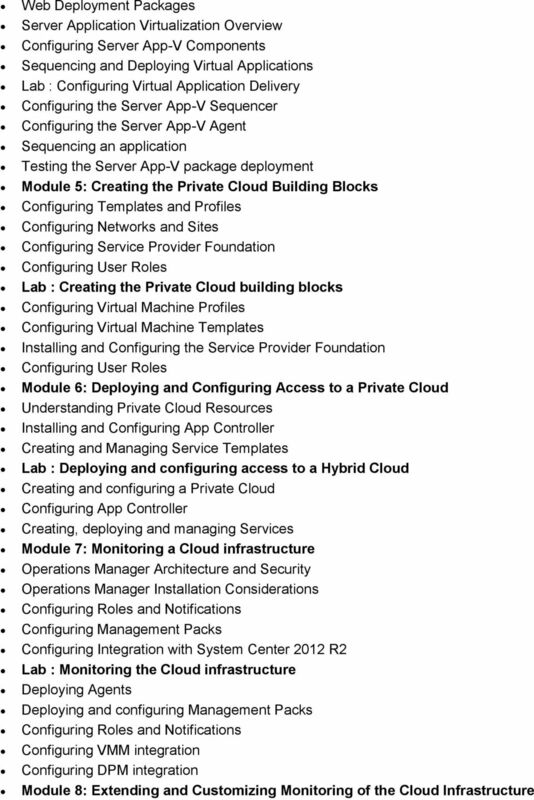 Create private cloud building blocks. Deploy and access private clouds. Monitor the cloud infrastructure. Extend and customize monitoring of the cloud infrastructure. Implement service management for the cloud. Configure high availability, disaster recovery and protection for a cloud. Automate and standardize the cloud. Configure a multi-tenant cloud. Target Audience This course is intended for cloud administrators who will be responsible for designing, installing and configuring a cloud infrastructure. The secondary audience includes datacenter administrators who are responsible for designing, installing and configuring the infrastructure for an on premise, Microsoft Private Cloud. In addition, the secondary audience includes people who need to learn the required material in order to take the Microsoft exam : Configuring and Deploying a Cloud with Microsoft System Center.